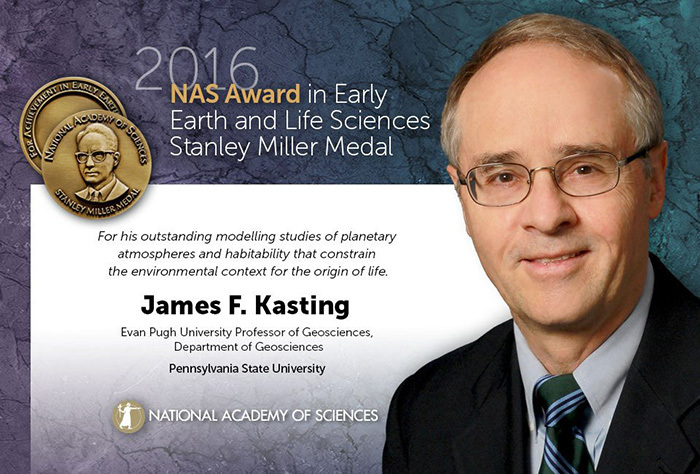 James Kasting, a SCRiM reseracher, has received the National Academy of Sciences (NAS) Award in Early Earth and Life Sciences – the Stanley Miller Medal. Kasting in being honored for his outstanding modelling studies of planetary atmospheres and habitability that constrain the environmental context for the origin of life. The Stanley Miller Medal recognizes research on Earth’s early development as a planet, including prebiotic chemistry and the origin of life; planetary accretion, differentiation, and tectonics; and early evolution of the atmosphere and oceans. Each medal is presented with a $10,000 prize. See full story on the NAS website.